In 2018, the outlook for China regarding its politics, economy, and relationship with the United States darkened considerably. The removal of presidential term limits and Xi Jinping’s interactions with the Trump administration prompted rare instances of internal Chinese dissent in a year marked by deepening repression. U.S. policies toward China gained in cohesion and assertiveness, demonstrated by an expansive levying of tariffs. China’s global influence continued to grow in the wake of U.S. withdrawal. But China, which in recent years has been masterful in playing geopolitical offense abroad, appears to lack the same sure-footedness now that the United States and other nations are finally making it play defense too. In an era of great power competition, China and the United States are testing the resiliency and adaptiveness of their respective systems. In 2017, Xi Jinping moved China closer to one-man rule while most of the world maintained an uneasy holding pattern in light of a diminished American presence. Many of China’s developments center on the theme of control. Domestically, the subordination of all corners of society to the Party continued. Abroad, what some consider an ethnonationalist foreign policy gained greater definition. China is no longer “hiding its light” and is unapologetic about the prerogatives to which it believes itself to be entitled. Under collectivist rule, the Party allowed a degree of purposeful incoherence to accommodate the great ideological differences on its path from Mao to the market. This created a modest space for debate and afforded those who sought change a place within the system. Xi is signaling that it is now decisiveness that is needed, even though the ideological differences have in many ways only become more pronounced. There are two interpretations of Xi’s push for decisiveness. One is of a country moving triumphantly towards supremacy. The other is of a country racing against time to seize what it can before growth, the basis of its strength, is exhausted. In tying the Party closer to his person, one can no longer disagree without doing so with Xi personally, risking the alienation of those who sought change within the system. Xi has, perhaps fatefully, greatly linked the survival of the Party to his own mortality. Are the tea leaves still good? Reading the tea leaves in old-school Kremlin- or Sinology has often meant paying close attention to newspapers – what is said and what isn’t, who is mentioned and who isn’t. The approach may still have its uses for understanding Chinese foreign affairs. An analysis of recent years of China Daily’s coverage may suggest important insights about how China sees the world. Over the past decade, articles mentioning a basket of regions or specific countries has exploded. This reflects China’s growing global presence and its deepening, if unbalanced international expertise. 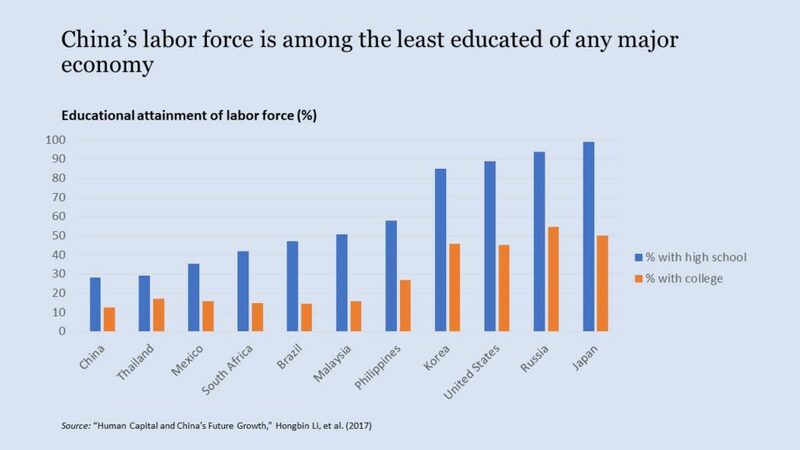 Tellingly, Japan, the United States, and Russia, account for a majority of countries/regions mentioned. Africa and Latin America, where Chinese involvement attracts significant scrutiny, are almost non-existent. 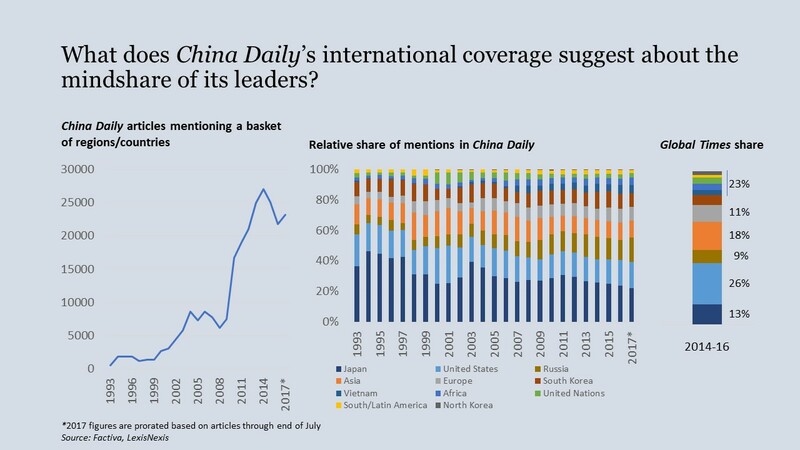 Global Times, which tends to be more nationalist, devotes a significantly higher share of its articles to the United States and Asia in general. As the primary government-controlled newspaper meant for foreign consumption, this indicates more than just the paper’s targeted audience. It also suggests the “mindshare” that each country and region commands among the Chinese leadership. Japan remains top of mind. Understanding the dynamics of Chinese politics has always been part science, part art, and part mystery. At the heart of these discussions are the factions around which Chinese politics is conceptualized. 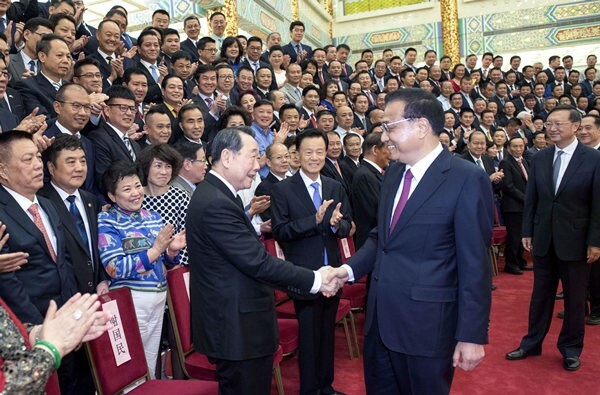 A recent paper has challenged many of these assumptions, simultaneously clarifying how power is distributed in China while raising new questions for where Chinese politics are headed. In “The Trouble With Factions,” Alice Miller, a fellow at the Hoover Institution and lecturer in East Asian Studies at Stanford, argues that much of what passes for analysis of China’s factions is ill-defined, arbitrary, and with little in the way of real predictive or interpretative value for those assessing China’s leaders. Were last week’s US-China breakthroughs a step back? China’s surprise announcement of a commitment to manage its greenhouse gas emissions last week made headlines the world over. That it was made during Barack Obama’s state visit, after months-long negotiations between the two nations, and alongside other meaningful advances on issues such as trade was celebrated as a cause for optimism about a fresh start for US-Chinese relations. That optimism, however, should not go without caution. Indeed, every bit of good news coming out of last week’s landmark agreement carries with it reason to worry about the state of US-Chinese relations and the broader system of global governance. Negotiated over a period of months by mid-level bureaucrats, the climate deal says much about the health of the bilateral relationship. For some long-time China watchers, Obama’s visit to Beijing reinforced the absence of a point person on Chinese affairs with direct access to Obama and the ear of Beijing. Those who lament this absence as a way of longing for the return of a Kissingerian figure singularly entrusted with managing the relationship are misguided. No individual can or should dominate a bilateral relationship as significant as this. The Kissingerian paradigm is a historical artifact that even China is evolving away from as their international diplomacy grows in experience and confidence. The efforts taken by the Bush and Obama administrations to institutionalize relations through the Strategic and Economic Dialogue have been a step forward. The climate deal is arguably the first significant success of the institutionalization of ties it has promoted. Yet, there is a reason to worry about the absence of a particular kind of point man. As the bilateral relationship becomes more institutionalized, it needs an official capable of coordinating the vast apparatus of the US government and uniquely able to advise the president on how to leverage it. This internal voice is inseparable from having a clear China policy. As the “pivot to Asia” has consistently produced more disappointment than progress, it is unclear in the final two years of the Obama administration whether there ever was a comprehensive China policy at all. Last week’s agreement could be less the sign of a step forward through which breakthroughs in other spheres will follow than it is the beginning of the usual pattern of presidential legacy-building abroad. The most important implication of this deal is its effect on global governance. Even prior to becoming president, Xi Jinping made much of a “new great power relationship.” Like most political rhetoric anywhere, its exact contours are hard to read but seems inescapable from Chinese equivalent of a G2. The Obama administration, for its part, has studiously avoided acknowledging this as a viable construct for managing US-China affairs. Its actions in bringing the climate deal to light, however, contradict this. The US may have seen this agreement as an attempt to “divide and conquer” the big developing powers who have held out on a climate deal. From this perspective, a deal with China may make one more likely with holdouts such as India, and thus make a global deal possible. While the deal may ultimately be good for the climate, it is potentially bad for global governance. Instead of requiring China to engage constructively in a multilateral context, the US has effectively let China’s “great power relationship” come to pass. A G2 works to China’s interests because it entrenches the expectation that the world’s two dominant powers can act outside of the normal global system. When working to advance global interests, it is almost excusable; yet the true value for Beijing (and, regrettably, occasionally for Washington) is when this dynamic allows them to act contrary to it. Even if the agreement struck last week with China were to make a global climate accord happen sooner than it otherwise would have, it is arguably a loss for the international community. Only if the international community is able to demonstrate its collective resolve on this and the ever growing list of transnational issues will global institutions earn China’s respect. The US too needs the strength of an empowered international community: in a G2-context, China can obstruct progress on global issues on the basis of the ups-and-downs of its bilateral relationship with Washington, cycles that Beijing has shown it is more than adept at manipulating. In a G2 world, Washington would be forced to choose between its commitment to human rights and the threat of Beijing derailing vital global agreements as a sign of its displeasure. Only when China is expected to act as a power within the full the community of nations can the voice of the United States be its most resolute. The US has the unique responsibility of ensuring China’s successful integration into the global governance system. That at times may come into conflict with the more limited set of truly bilateral issues the US may have with China, either directly or in support of its allies. Part of this integration must come from Washington ceding some relative influence in global institutions like the IMF and World Bank and allowing them to evolve to meet a new era. On this count, Washington has fallen short for some time, leading China to launch parallel institutions like the Asian Infrastructure Investment Bank. Integrating China into the global system must also come from a discipline to not engage China as a de facto G2. When Washington and Beijing act outside of the community of nations, it does not genuinely deepen China’s commitment to the global system. Instead, it reinforces a world in which two powers may unilaterally set the global agenda – two powers that Beijing hopes and Washington fears will in time become one. This essay was originally published on HuffPost. Earlier this year, the New York Times reported on a heated exchange between a group of American officials and their foreign counterparts. The Americans, the paper reported, denounced the other side as “deceitful, disrespectful and arrogant… The fact that you ask for ‘mutual respect’ is nothing short of laughable.” Surprisingly, the target of such strong criticism was not, say, China, but Canada, to whom New York State officials were expressing their frustrations over the ironically titled Peace Bridge that connects the two countries. Such negative language belies the very strong affinity Americans and Canadians have for the other, despite a host of trade, environmental, and other disagreements. But it is exactly this strong affinity that counterintuitively allows for direct, even heated, engagement that ultimately facilitates agreement. The most popular narrative of how the global balance of power is shifting emphasizes the end of the United States’ “unipolar moment” and the return of a multipolar order in which rising powers vie for influence alongside the European Union and the United States. Such a reversion depends upon the assumption that the traditional role of the nation-state will remain unchanged. This is not likely to be the case. As Richard Haass, former president of the Council on Foreign Relations notes, the state is increasingly challenged from all sides: above from global organizations, below from militias and empowered citizens, and from the side from nongovernmental organizations and corporations.